Milwaukee 18 volt Lithium-ion M18 Compact Hand Vacuum with tools and accessories. Zero Tool - batteries and charger sold separately. 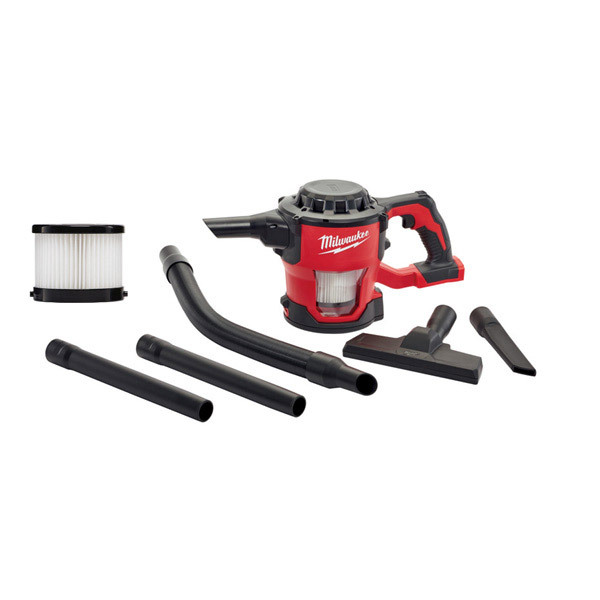 Milwaukee's M18™ Compact Vacuum provides users with the most powerful & adaptable handheld cleanup tool. A high performance motor creates best in class suction for cleanup of drywall dust, wood/metal shavings, and common jobsite debris. With a unique handheld design, the M18™ Compact Vacuum can be used in a wide variety of orientations and applications across the jobsite. Up to 23 minutes continuous run time on a 5.0 Ah battery.